Today our cooking journey finally brought us to Mexico, where I was born and raised. I decided to share one of the easiest and most satisfying recipes with the girls: Arroz con leche, or Rice Pudding in English. For this version I used two ingredients that might not be that easily found, which are sweet rice and Rompope. Sweet rice is a short grain rice that is used in Thai cooking for sticky rice. Rompope is a rummy eggnog made in Mexico that can be bought year-round bottled up. The one I use is Rompope Coronado and can be bought in several places on the west coast of the US. While we were waiting for the rice to cook we read a Spanish book that my sister gave Little Miss I, called “La niña que caminaba entre aromas,” translated as “The girl who walked among scents.” It is a lovely story about a girl born blind who learns to live and enjoy the world through smells and cooking. I so wish this was translated into English for more people to enjoy! But well, if you do speak Spanish, I do recommend this sweet story a lot. 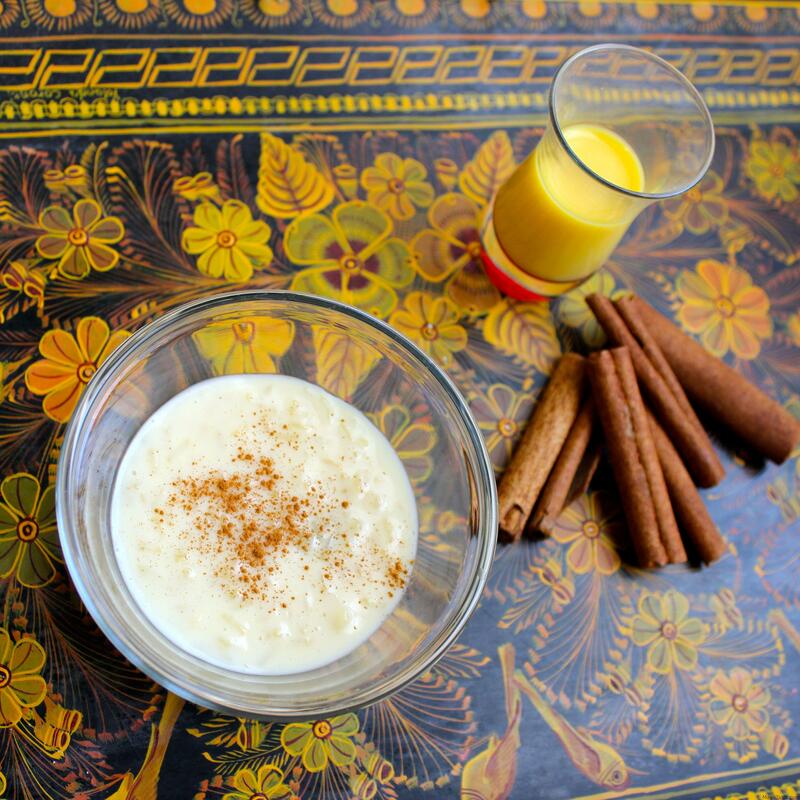 My take on Mexican rice pudding with sweet sticky rice and Rompope, a rummy eggnog from Mexico. Warm up the milk, water and Rompope over low heat, about 20 minutes. Once it is hot, but not boiling, add the cinnamon sticks and the rice. Adjust the temperature to simmer for 30 minutes, uncovered, making sure the milk doesn't foam and spill over. Once the rice is cooked and the liquid is almost all evaporated, turn the heat off. Add the raisins and pour the condensed milk, mixing everything very well. Pour for individual servings or transfer to your serving plate. Dust with cinnamon and let it cool off. You can eat it warm or put it in the fridge and enjoy cold. You can also serve it with a little drizzle of Rompope on top, but be aware that it has a bit of alcohol and that's not for kids. So, as we sang, "Arroz con leche, me quiero casar..." we had a very yummy afternoon snack that made me miss the motherland. Tagged Book reviews-recipes, Cooking with Children, Desserts, Mexican cooking. I love the idea of using rompope in the arroz con leche. One of my Tia’s told me how to make jelatina with rompope over the weekend so now I’ll have something else to use the rompope with! Thanks for sharing that tip! Can’t wait to try it!